Telemetry uses specialized technology to measure and transmit information. It has been used for years in meteorology, power plants, space flight and a wide variety of other fields, and is now commonly used in nursing. In nursing, various types of patient monitoring is done using telemetry: patients' internal functioning and vital signs are measured then sent to a machine, where specially trained staff can review and interpret the results. It is used in intensive care units, cardiac care units and neonatal intensive care units, to name but a few. Patients often have critical conditions and require constant monitoring. Telemetry nurses need to have advanced medical knowledge and the technical expertise to work with telemetry equipment. These tools can be used for patients with a wide variety of diagnoses. Patients need to be visually assessed every hour and any time the equipment alarms. 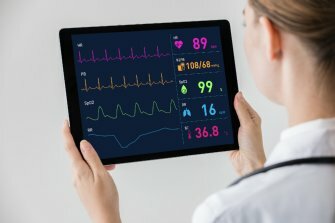 Telemetry is extensively used in hospitals across the United States and telemetry guidelines are aimed at improving awareness and promoting compliance. In addition to easing the burden of bed availability, the use of telemetry guidelines can lead to healthcare cost savings while decreasing inappropriate use of equipment. Level I – all patients. Required after cardiac arrest and CPR, during early phase of acute heart syndromes, unstable coronary syndrome in adults and children, implant of defibrillator or pacemaker, AV block, intra-aortic balloon acute heart failure, for therapeutic procedures, or for hemodynamic instability. Level II – most patients. Includes acute myocardial infarction, chest pain syndromes, implanted pacemaker, angiography, syncope, or for those that have a DNR with arrhythmia and discomfort. Level III – not indicated. Includes post–op patients with low risk for arrhythmia, obstetric uses unless there is cardiac history, permanent rate control, or for patients who are stable with chronic premature ventricular beats. There is a growing nurse shortage in the United States and increasing demand for telemetry RNs. Take a look at our telemetry nurse skills checklist and learn more about the telemetry unit.